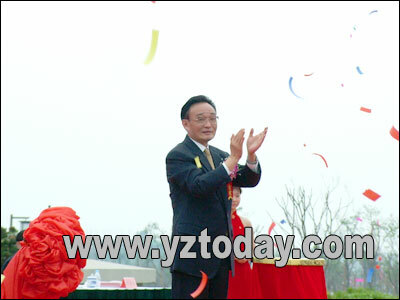 A new bridge across the Yangtze River, linking the riverside cities Yangzhou and Zhenjiang in eastern Jiangsu Province, is inaugurated open by Wu Bangguo, chairman of the Standing Committee of the National People's Congress (NPC) today. The 35.66-kilometre Runyang Bridge, connecting Yangzhou with an expressway to Shanghai on the south bank, is expected to launch a new boom phase in Yangzhou, said Hong Jinhua, the city's deputy major. It will take only three hours to drive to Shanghai, whereas local people had to rely on boats to ferry them across the river in past decades. There are also slip roads linking the bridge to expressways to Beijing and Nanjing, capital of the province. "The bridge will bring historic changes to the transport structure of the city," Hong said. The bridge, consisting of a suspended span 50 metres above the water, allows 50,000-ton cargo ships to pass underneath. 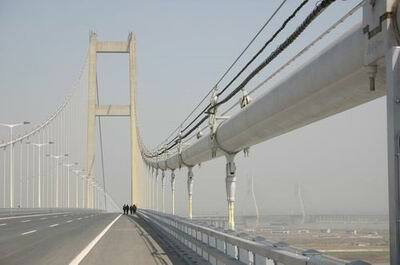 At present, there are about 60 bridges in operation across the Yangtze River. Yangzhou, known for its elegant ancient gardens and balmy weather, was once a booming waterway hub along the Beijing-Hangzhou Canal in the late 19th century and early 20th century. The new bridge and other infrastructure projects, could once again put the city at the transport centre of affluent Jiangsu Province. Aside from a web of highways linking it with other cities in the province, the city managed to build a railway station last year with a non-stop luxury overnight train service to Beijing. "Once the Runyang Bridge is completed there will be no obstacle to travelling in any direction from the city, and we'll have the chance to develop as much as Suzhou and Wuxi," said Li Jun, a Yangzhou citizen. The city posted a per capita gross domestic product of around US$2,000 last year, compared to more than US$5,000 in Suzhou, which is an hour's drive west of Shanghai, and has attracted more foreign direct investment than any other city in the country each year. "The Runyang Bridge will enable the city to shift from the era of the canal to the era of the Yangtze River," said Hong, adding that his city wants closer integration with the Shanghai economic rim. Social and economic development in Yangzhou has accelerated in recent years, evidenced by the enhanced living standard for local people. 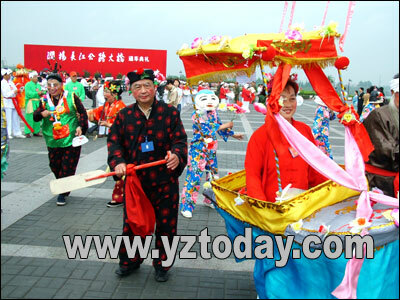 The city won the China Human Settlements and Environment Award from the Ministry of Construction at the end of last year. Meanwhile, Yangzhou is planning to hold an international trade and tourism festival from April 18 to May 18 to celebrate the opening of the bridge and to stimulate trade, according to Hong.